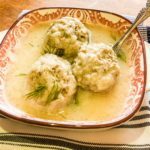 On this first day of April, midway through Lent, I had a craving for a delicious, traditional Karpathian dish — Traditional Greek Pasta, or Makarounes me Tskinosi. 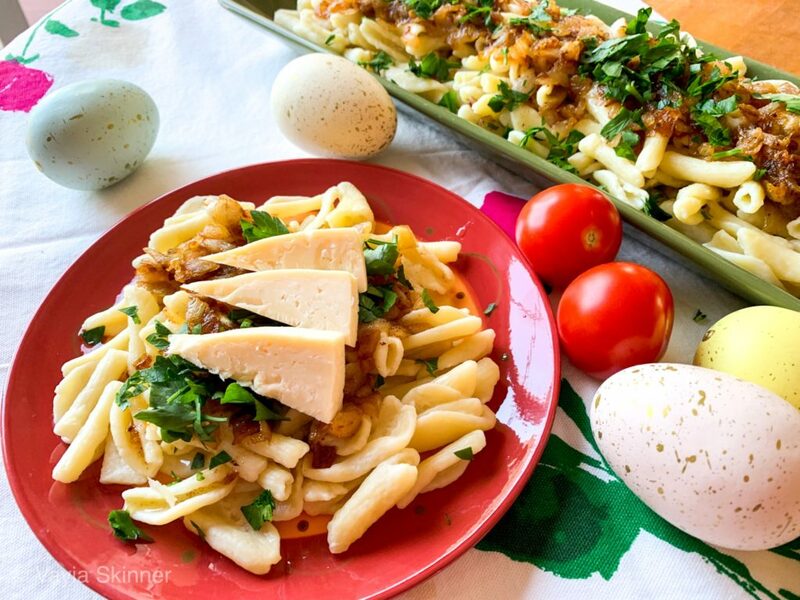 This tasty, meat-free dish features cavatelle pasta and sweet yellow onions, caramelized in olive oil and butter, and finished with grated sharp cheese. It’s simple, yet so satisfying. 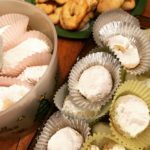 On the island of Karpathos, in the Dodecanese of Greece where my ancestors were born and raised, women traditionally not only hand made the dough for Makarounes me Tsiknosi, they also hand-cut each bite-sized piece. 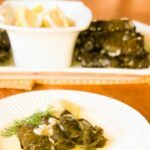 I remember my grandmother teaching me how to make this dish when I was 8 or 9 years old. It seemed like a lot of work! But the end result was well worth the effort. 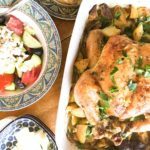 Pair this dish with a side of Traditional Greek Salad and some fresh, crusty bread, and you’ve got yourself a simple, yet delicious meal for any night of the week. While this dish is fairly easy to make, the caramelized onions do need babysitting. 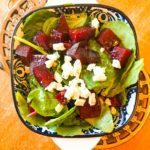 It takes roughly 20 minutes to achieve the golden brown sweetness that makes this dish such a standout. But in order to get there, you need to constantly stir the onions or else, they may burn and ruin the dish. Burned onions are bitter and best thrown right into the trash (trust me, I’ve learned from experience!). First, place a pot of water to boil on the stove. In a 10-inch skillet over medium heat, melt a stick of butter and a 1/4 cup of olive oil. (If you are thinking this sounds like a lot of fat, bite your tongue!). 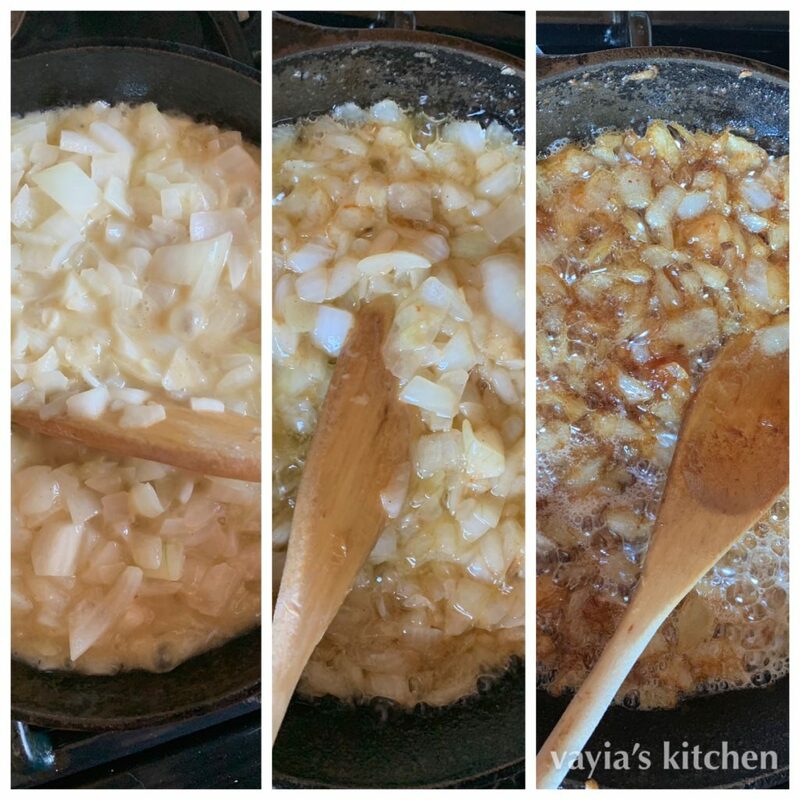 Add your chopped onions to the melted butter/oil mixture and stir frequently. The onions will begin to cook, releasing a fragrant aroma that is sure to cause your saliva to drool! 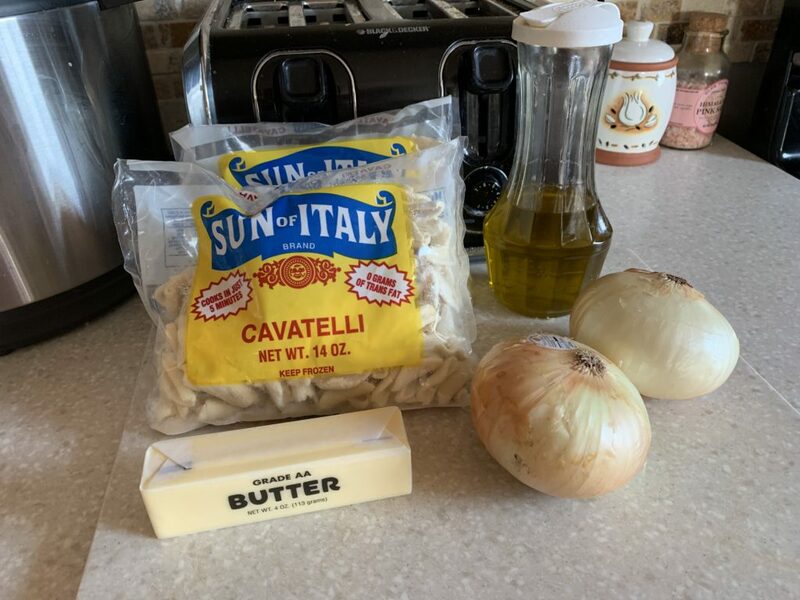 Meanwhile, when the water comes to a boil, add two packages of cavatelle to the water along with a generous tablespoon or two of salt to season the water. Cook according to package directions. Usually about 4-5 minutes until the pasta begins to float. Drain the pasta into a colander and then place back into the cooking pot, or in a dish if you’re ready to serve. Drizzle with olive oil for flavor and to avoid sticking. Continue stirring the onions until they achieve the golden brown color you see on the right — usually takes about 15 – 20 minutes. Spoon the caramelized onions over the cavatelle and stir to incorporate all of the delicious flavors. Top with grated fontina or your choice of sharp cheese. One of my favorite meatless dishes, Makarounes me Tsiknosi is traditional Karpathan dining at its best. 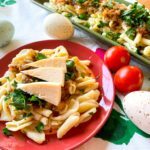 Bite-sized pasta tossed in caramelized onions, cooked in butter and olive oil is an easy weeknight meal and delicious for leftovers the next day. First, place a pot of water to boil on the stove.In a 10-inch skillet over medium heat, melt a stick of butter and a 1/4 cup of olive oil. Add your chopped onions to the melted butter/oil mixture and stir frequently. The onions will begin to cook, releasing a fragrant aroma that is sure to cause your saliva to drool! 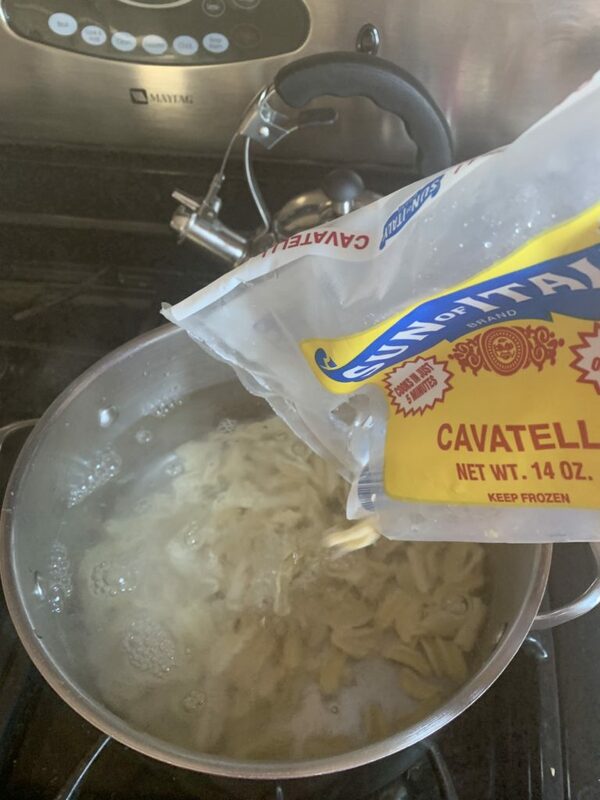 Meanwhile, when the water comes to a boil, add two packages of cavatelle to the water along with a generous tablespoon or two of salt to season the water. Cook according to package directions. Usually about 4-5 minutes until the pasta begins to float. Drain the pasta into a colander and then place back into the cooking pot, or in a dish if you're ready to serve. 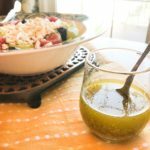 Drizzle with olive oil for flavor and to avoid sticking. Continue stirring the onions until they achieve a golden brown color. Don't let them burn! 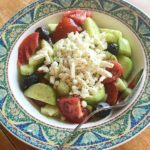 Top with grated fontina or your choice of sharp cheese.Enjoy! While this dish is fairly easy to make, the caramelized onions do need babysitting. It takes roughly 20 minutes to achieve the golden brown sweetness that makes this dish such a standout. 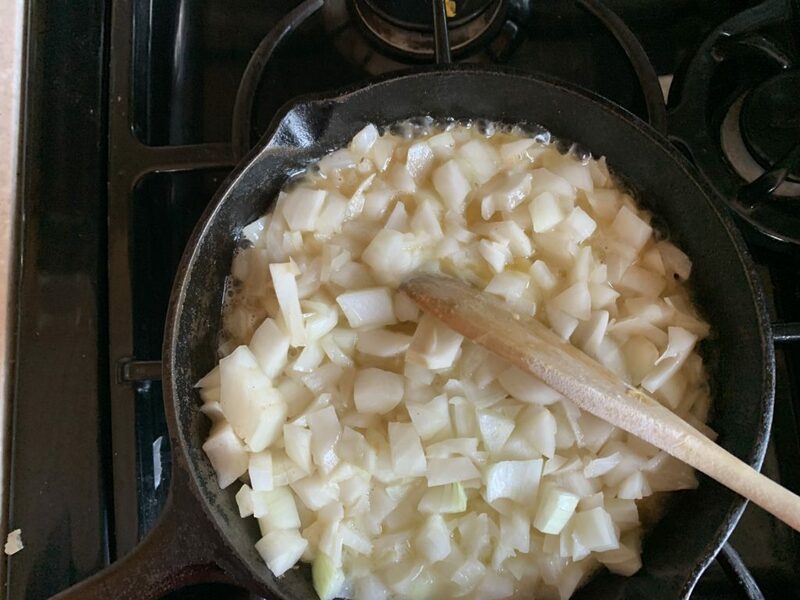 But in order to get there, you need to constantly stir the onions or else, they may burn and ruin the dish. Burned onions are bitter and best thrown right into the trash (trust me, I've learned from experience!). 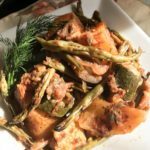 All content, recipes and photography are the copyright of Vayia’s Kitchen. They may not be used without written permission. If you would like to use one of my photos or recipes, please contact me. 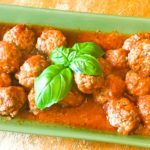 If you would like to adapt one of my recipes, please be sure to link back to the original post. 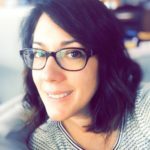 Vayia’s Kitchen is a participant in the Amazon Services LLC Associates Program, an affiliate advertising program designed to provide a means for sites to earn advertising fees by advertising and linking to Amazon.com. Copyright © 2019 Vayia's Kitchen. All Rights Reserved.